What We Have to Say …. It feels good to spend time in the sunshine, but it can take a toll on your skin. Research shows that UV exposure is the reason behind 80% of your skin’s aging! The consequences of sun exposure are both cosmetic and medical. Cosmetic changes include leathering of the skin, increased wrinkling, loss of facial volume due to other ageing effects and enlarged capillaries which leads to redness and uneven complexion. Medical changes include more frequent development of skin cancer, development of, and the tendency of sun-damaged skin to get more easily irritated and bruised. The sun gives off ultraviolet rays . UVA rays penetrate into the deep layer, the dermis, where your skin’s collagen and elasticity lives. When this layer gets attacked by sun damage, free radicals are released and cause harm to your skin cells DNA. The result is saggy skin, wrinkles, hyperpigmentation (dark spots and melasma), and potential risk of skin cancer. The signs of sun damage on the skin become visible from as early as the twenties. With the passing of time, these changes become more evident even if sun exposure is reduced or eliminated. Sun exposure damages five major parts of the skin. This damage can cumulatively involve the epidermis (actinic keratosis), dermis (solar elastosis), blood vessels (telangiectasia), sebaceous glands (solar comedones), and melanocytes (diffuse or mottled brown spots). These unwelcome patches of darkened skin are a result of photodamage. Age Spots are sometimes also referred to as ‘liver spots’ or ‘sun spots’. These spots can occur on the face, hands, the back, legs, arms and décolletage. Melasma is a chronic condition which requires treatment and maintenance. 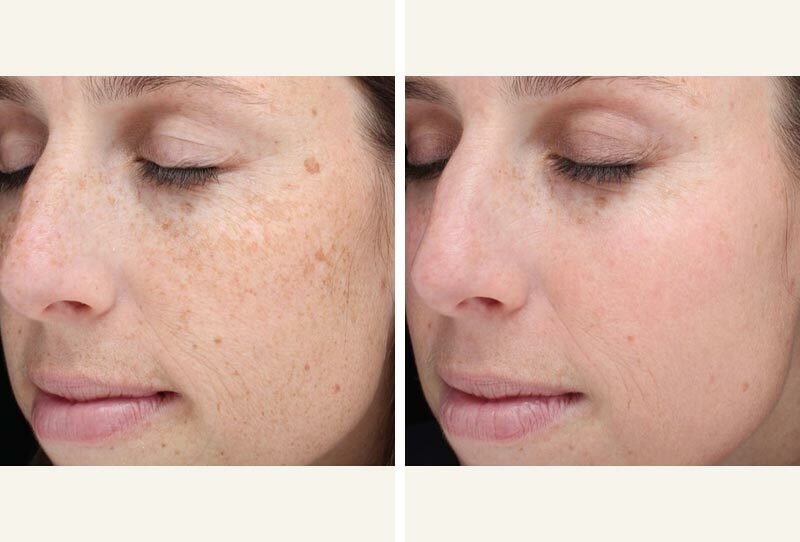 The exact cause of Melasma is uncertain, but typically it develops in women during their reproductive years and is thought to be triggered by factors such as sun exposure, contraceptive medication or hormonal fluctuations during pregnancy. Melasma, also known as hormonal pigmentation, is a skin condition characterized by asymmetrically shaped patches of brown or grey skin discolouration. It affects mostly women, but some men have been known to develop the condition. This is gold standard when it comes to treating sun-damage. BBL is different from laser therapy because it delivers multiple wavelengths of light with each pulse (lasers deliver only 1 wavelength). BBL is a type of non-ablative therapy. This means it does not damage the top layers of skin. This prescription skin cream can reduce wrinkles, rough skin, and discoloured skin. Chemical peels are often used to minimize sun-damaged skin, irregular skin colour (pigment), and superficial scars. The top layer of skin is removed with a chemical applied to the skin. By removing the top layer, the skin regenerates. This often improves its appearance. 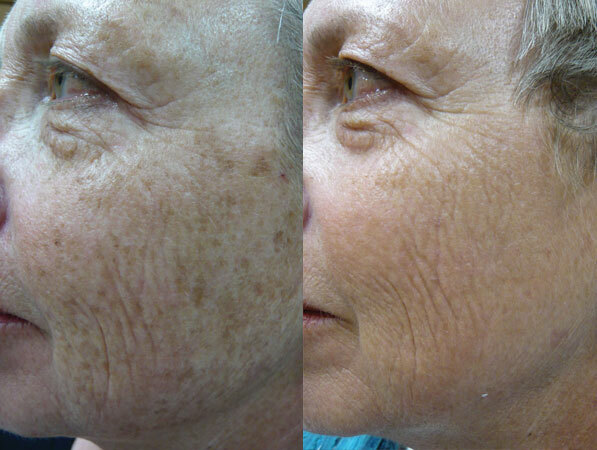 Laser skin resurfacing uses high-energy light to burn away damaged skin. 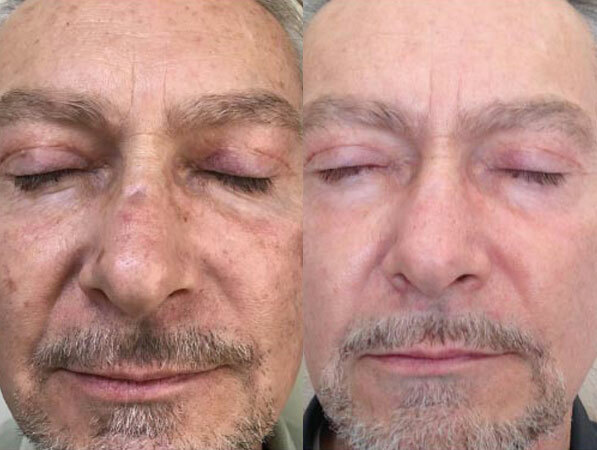 Laser resurfacing may be used to minimize wrinkles and fine scars. It is also used to reduce enlarged oil glands, lighten up sun spots, and remove wart-like growths. A soft tissue filler is injected beneath the skin to replace the body’s natural collagen that has been lost. Fillers are generally used to treat wrinkles, scars, and facial lines. Using botulinum will also soften existing wrinkles. But it won’t prevent the signs of aging. It is most often used for forehead lines and the lines between and around the eyes. When you visit Atlantic Dermatology and Laser for your initial consultation, our skin specialist Cherie Cochrane will assess the depth of treatment required. From there we will discuss the best treatments for your skin, how many treatments are needed and the healing time if applicable. We are committed to providing you with the most advanced procedures in aesthetic medicine. By integrating the latest cutting-edge lasers and skin devices into our treatments enables us to be ahead of the curve in so many ways and the results we are achieving for our patients really do speak for themselves. Set in the heart of Sea point, Atlantic Dermatology & Laser welcomes patients from all over Cape Town. We understand that situations arise in which you must cancel your appointment. However, when you do not call to cancel your appointment, you may be preventing another patient from receiving treatment. It is therefore requested that you provide at least 24 hours notice when cancelling or rescheduling your appointment; allowing another patient the appointment time. Appointments which are cancelled with less than 24 hours notification will be subject to a R900 cancellation fee. We understand that situations arise in which you must cancel your appointment. However, when you do not call to cancel your appointment, you may be preventing another patient from receiving treatment. It is therefore requested that you provide at least 24 hours notice when cancelling or rescheduling your appointment; allowing another patient the appointment time. Appointments which are cancelled with less than 24 hours notification will be subject to a R900 cancellation fee.